There has been a pause in my public fiber studies. I think my last one was number 25, and that’s more than two years ago (you will have to go to my old blog Hillevis Trådar in May 2011 to find the last study). 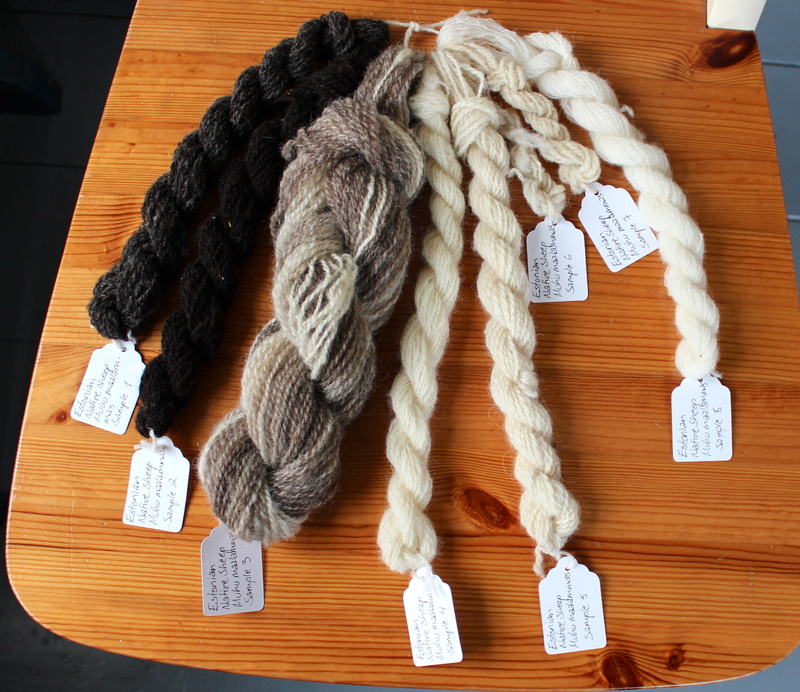 Since then I’ve spun lots of different breeds, but I haven’t documented them otherwise than I did in the portfolio for my Certificate of Achievement, or in my Handspun projects on Ravelry. It feels good to start a new series of studies with a rare breed from Estonia. Estonia is Finland’s neighbor in the south, with a textile tradition that few countries can compete with. Information about sheep and livestock in Estonia: here and here. Last summer I met a lady who’s originally from Estonia. She now lives in Finland, and is a member of my guild. We came to talk about wool – surprised, anybody? She said she could get wool samples from the rare Estonian Native Sheep. A couple of weeks ago hubby and I went to town to fetch the wool. Because, let’s establish from start: this is gorgeous wool in many ways. It’s strong, soft, some of it also has a nice lustre. There’s wool for all kinds of garments, from soft baby clothes to outdoor clothes for rough weather. Samples 6 and 7 were too brittle to card, but they were an exception. Both are extremely fine wools, very close to what we think of when we talk about the finer qualities of Merino. There was a severe attack of horseflies in the flock that provided the samples, and especially the young ones suffered from it. The farmer and her partners used the wool for felting. The flock is primarily used for landscape conservation grazing in the Muhu island off the western coast of Estonia. The wool had been washed in the sea, which in this case means it’s been washed in slightly salty water. The water in the Baltic Sea is brackish with less than 34 promille salinity. I’ll return to the interesting matter of wool and sea water in another post. Let’s move on to my sampling. I carded all samples except the two brittle ones, that I didn’t process any further than to see if the wool could be used. I spun a meter or so on a drop spindle. I spun all other samples on my Hansen Minispinner, and made 2-ply yarns. I did not wash the wool, as I wanted to work with it as it was because of the very special way it felt when touching it. I use a gauge for measuring crimp that I’ve copied from Dansk Fåreservice (I sincerely hope I don’t bread any copyright rules by showing it). It measures the amount of curves per 3 cm. Sample 1. Black wool with bleached tips. This wool had enough lanolin left to make it difficult to card and spin. I took off most of the tips. I tried to spin woolen, but had to modify into a semi-woolen/double draw. Staple length: 9 cm. Crimp: 5. Sample 2. Black wool with bleached tips. 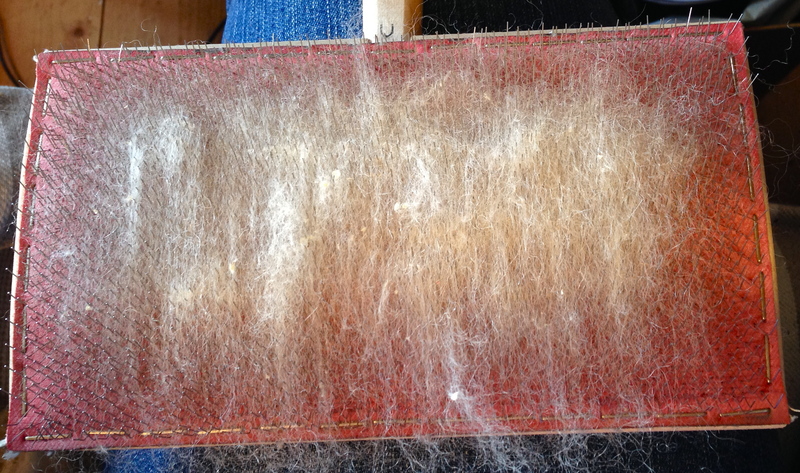 This wool had almost no lanolin and was much easier to work with than sample 1. I left the bleached tips for a tweedy effect. The wool was long enough to be combed, but I wanted to prepare all the samples in the same way, so I carded it and spun woolen/longdraw/double draw. That worked well too. Staple length: 10 cm. crimp: 6. Sample 3. Tri colored fleece. Soft wool of good quality. I carded it without trying to blend the colors, or sepataring them, only picked them randomly from the fleece. I spun two bobbins woolen/double draw, starting with the lightest color and ending with the darkest. Staple length: 14 cm. Crimp: 4. Sample 4. White, strong wool, that most of all resembled some of the longwools, like a sturdier Cotswold or finer Leicester. I carded it, but it could have been combed. I spun against twist. Staple length: 10 cm. Crimp: 3. Sample 5. White wool with low crimp. Soft! It opened up well, but – there was scurf. I decided to leave it and see what eventually falls out, which proved to be almost all. There was three types of fleece: wool, hair and kemp. It’s lovely wool, suitable for sweaters, socks, hats, mittens and woven fabric. Staple length: 8 cm. Crimp: 4. Sample 6. Very fine white wool. It’s fragile and can’t be carded without breaking, so I only spun a short thread on a drop spindle and doubled it. 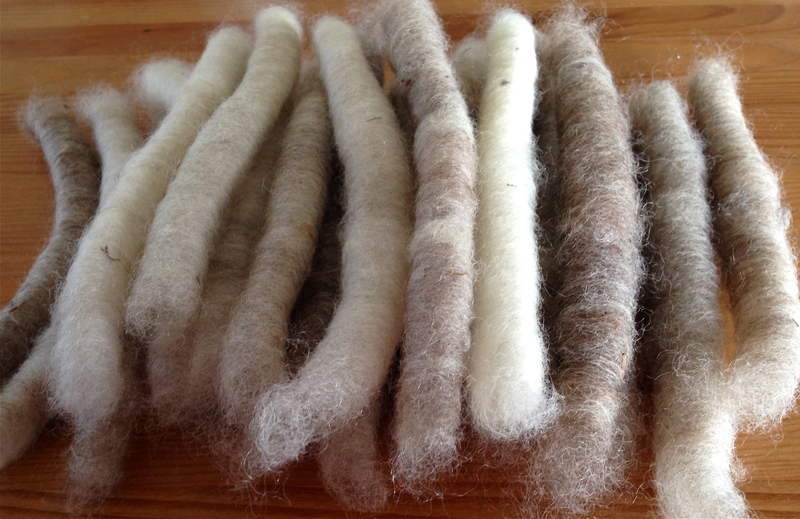 The wool is very soft and could be used next to skin, lace, and in baby clothing. Staple length: 9 cm. Crimp: 5. Sample 7. Very fine white wool. I think this could be neck wool from the same sheep as sample 6. It broke when I carded it, so I chose not to work with it more than in four tiny rolags that I spun on a drop spindle. The wool could be used in the finest of lace yarns and in baby clothing. Staple length: 8 cm. Crimp: 6. Sample 8. Very fine wool with a high percentage of lanolin. It’s soft and merino-like, and can be spun into super fine yarn. Next to skin, shawls, scarves, baby. Staple length: 5 cm. Crimp: 5. I was at once thrilled by how the wool felt. We call it “hand” or “handle”, the way wool feels when you touch it and work with it. It’s impossible to describe in words the information your hands give. I knew I hadn’t felt anything like this wool during my 30 years of spinning. All finished yarns are soft in way I haven’t experienced before. The yarns are also strong, so even the winter wool was of excellent quality. 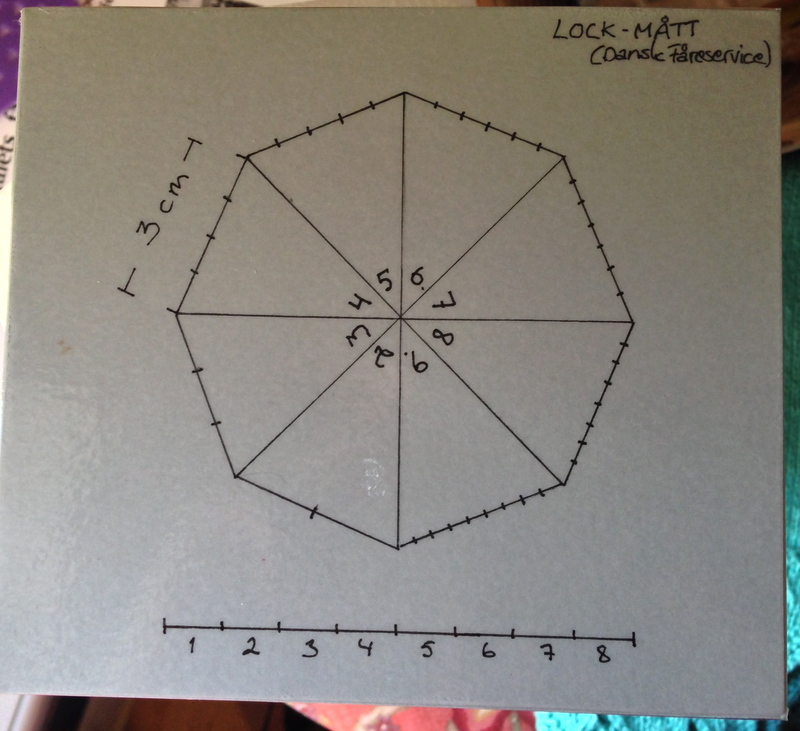 I was naive enough to ask what people know about wool and sea water in two groups of spinners in Ravelry and Facebook, and also in Online Guild of Weavers, Spinners and Dyers’ discussion group on Yahoo, hoping to have a few answers. I now sit here with 30 printed A-4 pages of discussion! I will make a summary in another post. What an amazing community spinners are! The textiles in Estonia are colorful and made with great skill. Muhu is known for it’s rich tradition in knitting, embroidery, band weaving and braiding, and there’s amazing crochet also. This photo shows a page from the book “Meite Muhu mustrid” by Anu Kabur, Anu Pink, and Mai Meriste. My Estonian guild friend Reet was kind enough to lend it to me. It’s a luxurious book like so many others that have been published in Estonia the last few years. 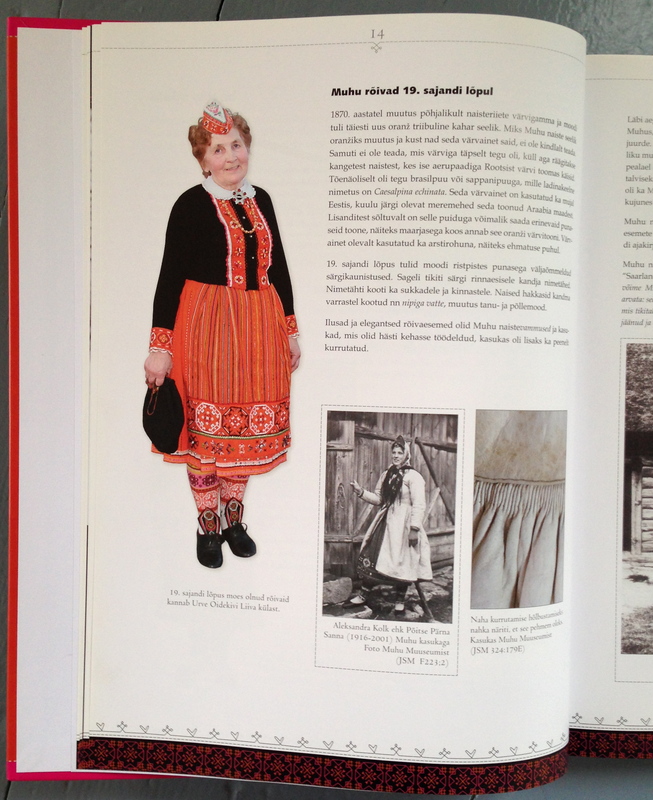 It has wonderful photos, and the charts are so clear that even if you don’t know Estonian, but have basic skills in knitting, embroidery or braiding, you manage without the text if you want to make some of the socks, mittens, or clothes. Estonian knitting really interests me and I enjoy looking at the wool. I do have the wool that you sent but the short staple makes it less enjoyable for me to work with, especially when I love to comb. Yes, Estonian knitting is not from this world… But I can’t have sent you Estonian wool. Those samples are the first I’ve ever seen. I think I sent you Finnish wool, probably Kainuun Harmas, Kainuu Grey? It’s short, but can be combed with Valkyrie fine mini combs. I’ll blog about that soon, yarn in the water now. Yes the wool you sent me was not Estonian…I get mixed up sometimes because I have waaaaay too much fleece in my house and garage Barbro!! This is fascinating! I would love to hear about the wool and seawater connection. 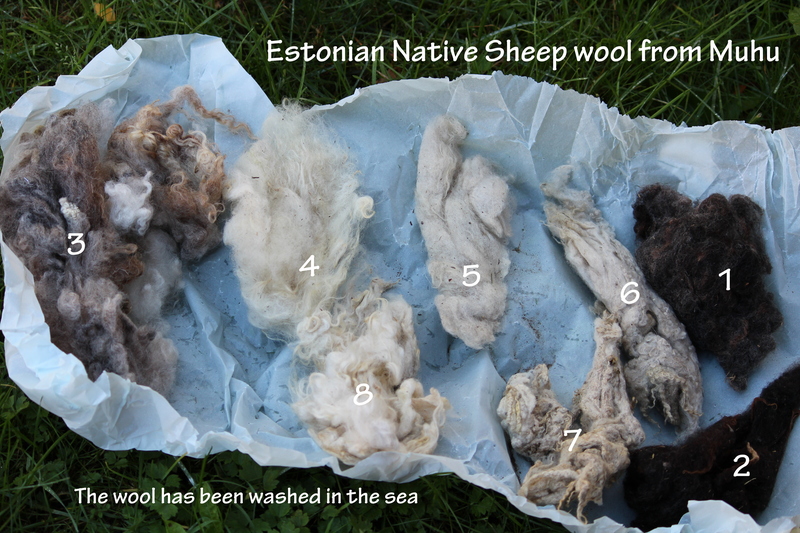 A post about wool and seawater will be posted on Friday night, Finnish time.